I was in the barn milking the cow one night, when I decided to change a lightbulb that had burnt out. It just so happens that this lightbulb is about 14 feet off the ground. So I had this great idea to put the lightbulb in my back pocket and do monkey bars out to the light bulb and change it. Needless to say things didn't go as planned. I got out to the third rafter, and I went to bring my left hand up to the right and...........yep you guessed it, I slipped. I don't really don't know what happened between the moment I slipped to the moment I hit the ground.All I knew was that I was on the concrete. When I opened my eyes I didn't think I was hurt. Jimmy Zeug had came out with me to the barn to help milk the cow and he came running out saying "are you OK?". I said "I'm OK" but when I pulled my left hand out I knew that I wasn't OK. If you look at the palm of your left hand and bend it alll the way over backwards, that is what it looked like. But worse! 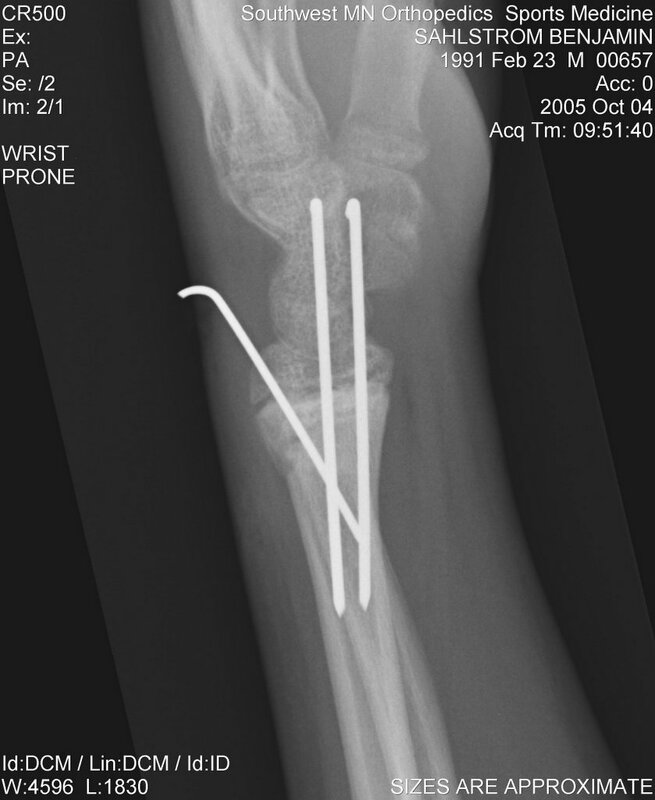 It was all twisted and the bone almost came thourgh the front of my wrist! It wasn't pretty.Jim said "Stay here! I am going to go get your dad." I didn't really care, all I wanted was some pain killers. They were back in a flash with the S10 pickup. They helped me to my feet and every slight movement was the most horrible agonizing pain. When I was finally in the truck my dad went flying to the house and ran in to get some ice and a pillow. My sisters came running out to see what had happened and they couldn't take the look of my wrist.Meanwhile my mom was calling all the hospitals to see where they should take me. She called Marshall first and the lady there told us to bring me in and they would look at it. But my mom asked them "Do you have an orthapedic surgeon?" The lady said, "Well, no he moved to Slayton." My mom hung up the phone the instant she said that and started looking for Slayton hospital's phone number.While she was looking the phone rang. She picked it up and it was Ian (one of my friends) and he said "Is Ben there?" My mom said "He just broke his wrist. "He said "What?" but my mom had already hung up.She finally got thourgh to Slayton and she told my dad where to go and we were off. It was the longest ride I had ever had (or so it felt) and every little tiny bump was the most intense pain. I think my dad was going like 90 mph on the way. After 45 minetes we were there. 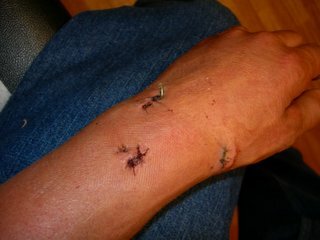 It was nice they brought out a wheel chair so I wouldn't have to move my arm to much. After we got in there they had to ask me tons and tons of questions like, where do you live?, what is your address?, what is your email address?, what state do you live in?, what country?, what province?, do you live in the northern hemisphere or the sourthern?, are you a terrorist?, have you ever killed somone? have you ever used the bathroom? etc. etc. etc. before they could even look at my wrist!After all that they finally gave me some pain killers and then she came and slamed on this honkin pack of ice! It was the most painful thing I ever felt! Next they talked to my dad for a little while and the they put a splint on my wrist. And they put me in bed. I slept pretty good. I had to use the bathroom once and it was really miserable. You are supposed to have the nurse come and help you, but I survived. The next morning I was starving but they wouldn't give me anything because they thought I would throw up from the stuff they use to put you under.They brought me to a different room and layed me on the butcher block so the could start cutting me open. They gave me this mask and told me to breath deeply....................................the next thing I knew I was in a different room with my parents. I begged them (the nurses) for some food and they finally gave me a tiny, tiny thing of Cheerios. They were good after not eating for so long. I didn't throw up either.We went home and I was bumming because I couldn't ride fourwheeler because I couldn't pull the cluch. I fixed that! I took and put the cluch on the right handlebar so I did the throttle and the cluch with the same hand! 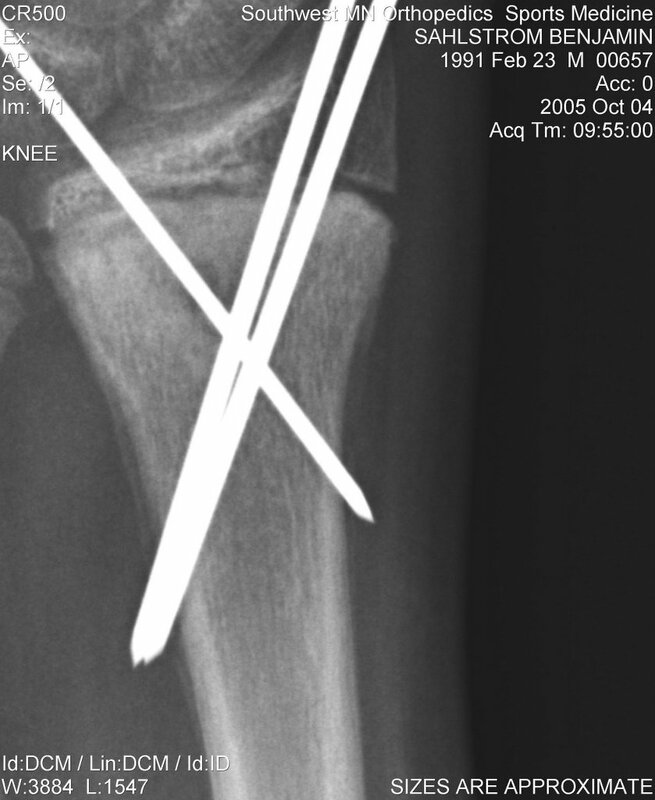 Suprisingly enough it worked really good!Those two weeks felt like eternity with that wrist. but they were over eventually. We went back in to the doc to get a cast on (up till then I had a splint)They unwrapped it layer by layer and when they got down to the skin I was horrorfied at the look of the skin. 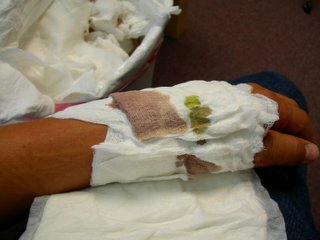 there was all this green puss and the cloth was stuck to my skin and they just ripped it off!After they finally got it off, they cleaned it up a little more and then they put the cast on. I chose blue. 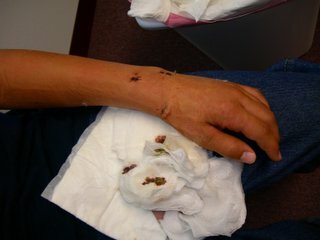 The splint held my arm almost all the way up to my armpit and the cast was only on my forarm. 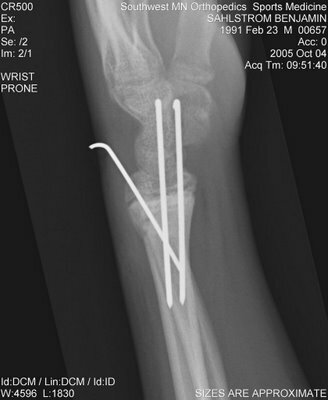 So I could only move my arm partially.After two more weeks they took off the cast with a big thing that looks like a saw, and then out came the pins. They just hold you down while this guy uses a gigantic pliers to yank them out! They don't even give you pain killers! The next day I had to go be in my aunt Mindy's wedding. It is a good thing that I got my cast off otherwise I would have had to cut the tux!Well anyway that is the story on my left wrist. I just read your wrist story! I laughed so hard at the line of questions you had to answer. "Are you at terrorist? Have you ever gone to the bathroom?" That is exactly what it seems like! I am glad we are past that, though! Good story, though!